Tomorrow, Saturday, marks the first anniversary of the Eastern Partnership Summit in Vilnius, where then Ukrainian President Viktor Yanukovych refused to sign an Association Agreement with the European Union. One year later Ukraine is embroiled in a civil war that has claimed more than 4,000 lives. NATO is on the verge of an armed conflict with Russia that threatens humanity with nuclear annihilation. How did this come about? Western propaganda answers this question with five letters: PUTIN. The Russian president thinks in “spheres of influence,” breaks international law, endangers “the framework of peace in Europe” and seeks to annex not only Ukraine, but also Georgia, Moldova and the Baltic states, according to the accusations of German Chancellor Angela Merkel. A flood of propaganda spread by the media 24 hours a day tries to convince the public that only the villain in the Kremlin is preventing Ukraine from developing into a prosperous oasis of democracy, and Europe into a paradise of peace. The WSWS has absolutely no sympathy for the Russian president. He is a right-wing nationalist who represents the interests of Russian oligarchs and is diametrically opposed to the socialist and internationalist goals for which we stand. But to make Russia responsible for the escalation of the crisis in the last twelve months stands reality on its head. Mearsheimer, a proponent of the school of international relations theory known as neorealism, examines the conflicts among states, but does not deal with the economic and social issues that also play a role in the Ukraine crisis. However, his assertion that the US has encircled Russia to maintain its position as a world power, while Germany is striving to become one, is correct. The penetration of Eastern Europe by NATO and the EU has a further dimension. It aims to transform Ukraine and eventually Russia itself into a kind of semi-colony—a reservoir of cheap labor and raw materials for Western companies, a market for their products and a source of profits for hedge funds and Western banks. To this end they require a regime that is subordinate to NATO and the EU and brutally suppresses the working class. This was the aim of the Association Agreement that Yanukovych refused to sign a year ago and which, after his overthrow, was accepted by the new regime. The Agreement protects the assets of Ukrainian oligarchs and opens up Ukraine to western corporations and banks while luring the political elite and a small layer of the middle class with bribes from the EU. To the broad mass of the population it has nothing to offer but unlimited quantities of “Greek medicine”—austerity programs prescribed by the IMF and the EU, massive cuts in spending on social welfare, education, health and administration, and the closure and privatization of factories. Initially Yanukovych supported the Association Agreement, but eventually decided against it because he feared for his political future. He feared a social explosion if he implemented the cuts demanded by the EU in what was already a desperately poor country. For its part, Russia offered Ukraine cheap loans, while the EU insisted on immediate drastic savings. In order to bind Ukraine to the EU and NATO despite this, it was necessary to organize a coup and to mobilize fascist forces. 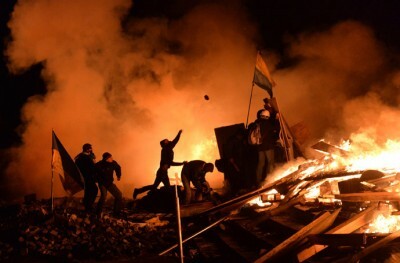 From the start, the protests on the Maidan were under the influence of western backed forces. US Deputy Assistant Secretary of State Victoria Nuland later admitted that the US had invested over $5 billion in such forces since 1991. At first, just a few thousand took to the streets, and there was no evidence of a widespread sentiment in favor of the EU. Public opinion polls show that during the last ten years only 30 to 40 percent of the Ukrainian population favored EU integration, with about the same number favoring integration with Russia. The spokesmen of the protests were familiar figures: Arseny Yatsenyuk, a representative of the US sponsored Orange Revolution of 2004; Vitaly Klitschko, who lived in Germany, a professional boxer with close ties to the CDU-affiliated Konrad Adenauer Foundation; and Oleh Tjahnibok, leader of the fascist Svoboda party. In what was a complete break with diplomatic norms, government members and parliamentary deputies from NATO countries mixed publicly with demonstrators who blocked government buildings and demanded the overthrow of the elected president. When Yanukovych refused to yield to the demonstrators’ demands, armed right-wing groups began to dominate events on the Maidan. Svoboda transported its followers into Kiev from its strongholds in the west of the country. Virtually out of nowhere, the Right Sector, an alliance of neo-Nazis and paramilitary militias emerged. The conflicts became more brutal, snipers killed dozens of people. It has not been settled until this day if they were part of the security forces of the regime or political provocateurs from the ranks of the opposition. The seizure of power by ultra-nationalists in Kiev unleashed fear and panic, especially in the east of the country, with its large Russian-speaking population. With support from the Kremlin, Crimea declared its independence and was incorporated into the Russian Federation. Pro-Russian separatists took power in Donetsk and Lugansk and have been at war with the Ukrainian central government ever since. In the meantime the US and Germany have systematically used the crisis, which they brought about, to increase military and economic pressure on Russia. NATO has moved troops into Eastern Europe, increased surveillance flights along the Russian border, organised land and sea manoeuvres in the vicinity of Russia and is systematically rearming. The US and the EU have imposed economic sanctions against Russia and cut off the country’s access to international finance. When one seeks the real causes of this dangerous escalation and the related threat of war, it is necessary to look at the White House and the Chancellery in Berlin, rather than the Kremlin. As was the case in the first half of the last century, the imperialist powers are responding to the crisis of world capitalism and growing social tensions with war and dictatorship. The events in Ferguson show that American society is on the brink of a social explosion. The same is true for Europe, where unceasing waves of austerity are forcing broad layers into poverty and unemployment. The ruling elites respond with militarism at home and abroad, the conquest of new spheres of influence, markets and raw materials, accompanied by the development of state surveillance and apparatus of state suppression. There is only one way to combat this development: the building of an international socialist movement of the working class, which combines the struggle against war with the struggle against its root cause, the capitalist system.